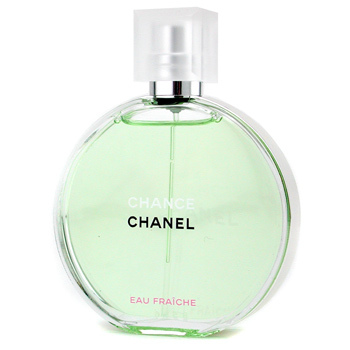 Chanel Chance Eau Fraiche was launched during March of 2007, which is a lighter version of 2002’s Chance fragrance. The new version of Chance was developed by Jacques Polge, Chanel’s own in-house perfumer. The new Chance isÂ indeed very light and fresh. The scent is a creamy floral that smells fun and youthful, but elegant and sophisticated at the same time. Its base notes are composed of citrus and jasmine, which emphasizes the refreshing yet feminine impression. Notes included are: Citron, Water Hyacinth, Jasmine Absolute, White Musk, Vetiver, Amber Patchouli, and Teak Wood. Many people who have tried Chance actually prefer it more than Chanel No. 5, which is probably one of the most well known fragrances of the world and an icon in the perfume industry. It appears as though people are going for a more sparkling fresh type of scent as opposed to the heavier parfum in the older days. Although No. 5 isÂ the moreÂ famous of the two, the new Chancel Chance is perhaps more appropriate for modern perfume users. I, myself, prefer the light and refreshing scent, so I personally recommend Chanel Chance. Chanel Chance by Chanel retails for $82 USD for a 3.4-oz. You canÂ click on the image to purchase itÂ from Delicious Scent’sÂ sponsor for less. Jennifer Lopez’s new perfume, Deseo, was inspired by her garden. True to her words, Deseo does smell like a garden. In fact, the scent is a mixture of leaves, flowers, and woods. This doesn’t surprise me since Deseo contains notes such as Bamboo Leaves, Freesia, Orange Blossom, Amber, and Oak Moss. It was just surprising that the fragrance literally smelled like a garden â€“ J. Lo’s garden, in this case. It even comes in a bottle that looks like rock, to boot. I think garden based scents are great for room sprays if one fancies it, but not as a perfume. Correct me if I’m wrong, but I believe most women like Floral, Citrus or Fruit scented perfumes that are refreshing, not overly sweet smelling,Â and makeÂ one feel more confident and feminine. Unfortunately, Deseo achieves none of that – not that it doesn’t smell good, but it isn’t exactly the greatest formula for women’s perfume. However, it would probablyÂ make a good room spray in which I’d label as ‘Midnight Garden’ or whatnot. But I personally wouldn’t use it as a perfume simply because I don’t want to walk around smelling like granny’s backyard. No offense, grandma. Deseo Eau de Parfum retails for $46 (1.7 oz.) and $56 (3.4 oz. ).